Surrounded by beautiful natural scenery, San Marcos has some spectacular places to take a hike. Whether you want to meander along a bubbling brook, take in the sights and scents of a flowering meadow, or walk beneath the shade of a cool forest, there are many options to get outside and explore the magnificent natural treasures in Central Texas. For peaceful riverside hiking, Blanco Shoals is a great option. This property, which was donated in 2002 for public use, is a largely undeveloped space along the marvelous Blanco River. Hiking along the Blanco Shoals path, you’ll get unimpeded views of high bank bluffs and shoals. Majestic sycamores, cottonwoods, and pecan trees line the trail and offer plenty of shade to block out the sun’s relentless heat. The surface is flat, which makes for comfortable walking. This hiking spot is also an excellent place to watch birds, bats, and other wildlife. Covering 570 acres, Purgatory Creek is one of the most popular hiking places in Texas. Here you’ll find a diverse mix of natural wonders, ranging from colorful meadows to stunning canyon bluffs and wetlands. One of the most popular walking spots is Prospect Park, which sits on a section of the Edwards Aquifer. Along the park’s three miles of trails, you’ll be treated to sights of ash juniper groves, oak mottes, caves, and meadows as you walk along the trail. Interpretive signs along the way point out significant natural features of the area, and there are benches along the way to stop and rest. The lower meadow contains a unique feature called the Learning Tree, which offers visitors a chance to sit and rest and engage in educational opportunities. With cactus stands, birds, and reptiles, Ringtail Ridge Trails offers a true Texas scene. This hiking destination is located off Ranch Road 12. The trail system here, which covers 40 acres of land, winds through oak groves and persimmon thickets. Shade covers the trails, making it easy to escape the sun’s rays and take in the surrounding sights. Although it is one of the newest hiking and recreation areas in Texas, Schulle Canyon has developed a reputation as a prime spot for birding and nature watching. The area contains 21 acres of diverse land with oak and elm trees and rivers. The Virginia Witte Way Trail, which is a half-mile long, six feet wide, and made of crushed limestone, is a go-to outdoor destination for individuals in retirement communities. Kinglets, thrushes, chickadees, wrens, and cardinals are frequent visitors, making Schulle Canyon a great place for beginner birders. Covering over 250 acres of parkland, Spring Lake is one of the most ecological, diverse outdoor sanctuaries in the Lone Star state. Once used for hiking and ranching, this spot has been converted into an outdoor recreational area. 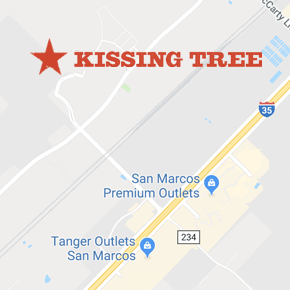 Because of its proximity to San Marcos Springs, it is thought to be one of the oldest continuously occupied areas of North America. Through grants and donations, the City of San Marcos purchased the land in 2007 and made it available to the public for use. The property includes the Edwards Aquifer Recharge zone, San Marcos Springs and Spring Lake, which support five types of endangered species. Locals consider this spot one of the most beautiful in Texas, where you can walk nearly seven miles of trails lined with oak trees draped in Spanish moss and see meadows with Blue Stem grasses, flowering Mountain laurel (which blooms for two weeks in March), flowering Kidneywood (which blooms in April), and butterflies. Woodlands prevail in this unique spot. As you walk from the hillside down to the meadow, you may see flora and fauna including Mexican buckeye and large mammals.